Professional golfers like Old Palm residents Lee Westwood, Charl Schwartzel and Louis Oosthuizen arenât the only ones who play better when theyâre in shape. Golfers of all abilitiesâmen and womenâcan benefit from being fit, which is why the Titleist Performance Institute-certified exercise class at Old Palm has become so popular. 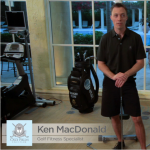 âThe class focuses on training our members to improve the efficiency of their golf swing by improving range of motion, lower-body stability, core strength and motor control as it relates to the golf swing,â explains Ken MacDonald, Golf Fitness Specialist at Old Palm. During the one-hour class (Thursdays, 9:30 a.m.), MacDonald teaches members how to make their bodies more resistant to injury by practicing movements that are characteristic of a good golf swing. He breaks the swing into distinct parts, allowing members to more easily focus on essentials like properly hinging from the hips at set-up, developing a better coil on the backswing, and creating more speed in the downswing. The class concludes with a strength circuit, after which golfers are ready to play Old Palmâs spectacular Raymond Floyd-designed golf course.